By any objective standard, Military Retirement is an extreme transition. Among the many issues the prospective Retiree considers is the professional next step – i.e. “2.0 Plan”. For many reasons, contracting is a bright, shiny object. Embarking on this path is far from trivial. Retiring from Active Duty is a herculean task with many move parts. For a detailed rundown on some points to consider along the way, please read here. At some point in their careers, military members realize the gargantuan amount of contracting the U.S. Government does – you have to rub your eyes at the numbers…they are daunting, and in most cases, recurring. Moreover, military members develop relationships with the individuals employed in contract positions, who are by-and-large, older versions of themselves. Understandably, upon exiting military service, entering the wonderful world of government contracting is a natural progression. Pension – no mystery here – someone retiring from Active Duty is entitled to an immediately-vested Defined-Benefit Pension that is inflation-adjusted for life. Tricare for Retirees – prior to age 65, military Retirees enjoy their choice of Tricare Select or Tricare Prime, both of which have an annual maximum out-of-pocket expense of $3,000. After 65, enrollment in Medicare is mandatory (Check the expiration date of your ID Card, which is a not-so-gentle reminder) and Tricare For Life benefit kick-in. I’m simplifying somewhat in the interest of space. VA Disability – every Military Retiree should go through his/her respective VA Disability rating process. These benefits are tax-free and inflation-adjusted for life…a doubly great benefit. Collectively, these benefits provide an enviable backstop for one’s financial life. Simply put, a Military Retiree will have monthly income, access to affordable health care, and many retiree-related service to which he/she may avail himself…this is all as it should be - military service is an monumental sacrifice. Practically speaking, these benefits also dictate that a Military Retiree need not necessarily concern himself/herself with the “benefit package” a prospective employer offers – medical coverage being the primary example. While anything is possible, it is unlikely you are going to beat Retiree Tricare (in October 2018) coverage on price…though admittedly, that is only one of many factors. The net of this section is to realize that the aperture of prospective employment opportunities is ridiculously wide. Contract employment is decidedly different from Active Duty service…very different. It is important to familiarize yourself with these differences before entering the contract world – different expectations and different rules. Generally, every contract has specific performance specifications. While not typically enforced, it is indeed possible that a contract may be terminated followed by a release of all the contract employees. After a pre-defined period of time after being awarded, contract are typically “re-bid”, where other organizations are permitted to submit proposals to compete for the same contracted service.Leaving aside a slew of other details, this may mean a new parent company contractor, who may bring a different set of benefits, and more importantly, a different pay scheme. This construct is decidedly different than the Military Pay system a Retiree grew accustomed to over a 20+ year career. Typically, a contract will detail the exact functions to be performed. While on Active Duty, superstars make every job they take better than he/she found it though novel thinking, dynamic performance, and results-based initiatives, contracting differs greatly. Work hours are studiously tracked, contractors usually do what they are told, and the performance requirements are strictly enforced. There are other considerations – I am simply trying to highlight some of the headline differences between Military Service and contract employment. Execute the proper Estate Planning Documents you need. Estate Planning is a constant work in progress. Pay particular attention to this item if your current estate docs were prepared by a Military Lawyer or if you are changing your state of residence. Update Beneficiaries for all accounts requiring them. This is hyper-critical if you have gone through a major life change (i.e. Marriage or Divorce). Establish an Emergency Fund. I cannot emphasize enough how critical it is to have funds set aside for emergencies...life happens, so be financially prepared for it. Accurately Assess your Risk and mitigate with insurance (i.e. Long Term Care or VGLI). You will have numerous organizations reach out to you looking to provide you insurance. Everyone's situation is different. Develop an Executable Budget. Your income is likely going to change significantly. Not only is your pay from the military probably going to go down, your pension is fully taxable as income - the good 'ol days of a Tax-Free Housing Allowance and maybe COLA are done. So give some consideration to what your income streams will be and how much they are. And more importantly, accurately assess your expenses and account for ALL of them. What is their longevity in the Government Contracting space? Do they treat employees well? Has anyone lodged complaints against them? Talk to other Military Retirees who are presently working or have worked for this company! As you exit military service, the prospect of being “unemployed” can be a real shocker. Couple that with the emotional tidal wave that comes with a retirement ceremony and you have a full-fledged stress factory. Therefore, it is not a bad idea to take SOME time off after the retirement party to relax, degauss, and take in the life change for a bit. This strategy will help you avoid jumping on the first opportunity to come your way. 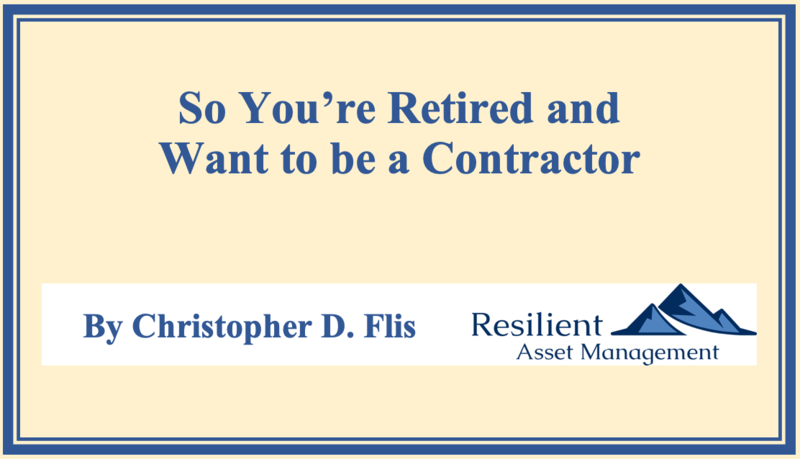 Rest assured, as a Military Retiree, you have built-in credibility, timeliness and punctuality are your hallmarks. there is a thirst for leadership in every corner of America’s corporate world. Trust me, there is a place for you in the American workforce....regulations typically prohibit me using the word "guarantee" - whatever - I guarantee there is a place for a military retiree in the American workforce. Salary is undoubtedly an important consideration when seeking employment. However, it should not be the only one. Therefore, consider other aspects of employment: Hours, overtime, travel, “Exercise” hours, vacation, sick leave, etc. There is more to life than simply seeking the highest paying job. Every company involved in the U.S. Government contract space has probably employed Military Retirees at some point. They are ALL aware of what a Military Pension is and can easily calculate the benefit you are receiving. This amount is immaterial to your present employment! So DO NOT permit your pension to “reduce” the amount you would otherwise be paid, period. For those who think it wise to venture out on his/her own to start a Contracting Company, there are even more considerations…I will discuss those next. Attorney: Having a reliable Attorney is an invaluable resource. Among other things, a great Attorney can highlight your Blind Spots, which can befall the best among us. Accountant: Income Taxes as a Business Owner will undoubtedly be more complex than without it. Therefore, an experienced Accountant familiar with your situation can also be extremely helpful. Financial Planner: Having someone in whom you can confidently place your trust to assist with managing your affairs is very helpful. Among other benefits, you can free up your time to dedicate to your work. There are many other benefits as well. This is one of the more important decisions you will make. Moreover, for most, this is probably some of the more unfamiliar waters into which you will be venturing. Obviously, I am not an attorney, so I will not go into the nuances of the various options here. Suffice it to say, there are both legal and financial considerations. Fortunately, many professionals service Clients in this ares, so seeking assistance is remarkably easy. To reiterate, this is not an area where you can Google search your way to success - the legal world is riddled with landmines - find a trusted Attorney who can assist you with side-stepping them! Business Expenses are definitely deductible, though some people cross finances up and mix personal expenses with business ones. Don’t play games with expenses – the Schedule C on your Federal Return is ripe for IRS Audits – make sure you can legitimize all the expenses you list on it. There are a bevy of tools out there to assist with what used to require an Admin Assistant and other functions. If it is bothering you business-wise, there is probably an APP (or 10) for it - scheduling, miles, expense management, invoicing...it is probably out there. That said, NEVER underestimate the value of an in-person meeting....it is worth 1,000 e-mails and a million texts. If you are on the web – and most people are – take the time to develop a professional looking website and keep content current. If you can’t commit to it, then don’t put a website up – go a different route with gaining exposure for your company. If you are using an @gmail.com (or similar) address, this can detract from your marketability as a business person. Set-up your email through Gmail, which they will assist you with. Then, you will have a customized email address – setting this up should not take more than an hour or two, and it is remarkably inexpensive. Moreover, you gain access to the Google G-Suite, which is laden with tools to assist in your productivity. I suggest not printing your own on card stock – potential printing nightmares and the end product is usually middling. Go on-line and create your own cards and let the professionals print them for you. In most cases, you are bringing the next Facebook on-line...so there are likely many "Influencers" or the like in your chosen area. In Financial Planning, nearly everything circles back to Michael Kitces and his media juggernaut. Before I became a Financial Planner, I knew nothing of Mr. Kitces...so find the Micheal Kitces of your field - most experts are very giving. A pretty famous Van Halen (I am dating myself somewhat) story referred to the contract they used for their live performances. In the contract was a stipulation that they have a bowl of M&Ms in their dressing room. Some thought this was the height of privilege for a spoiled band. However, the reason they inserted this into the contract was to see if their venue manager actually read the thing. So make sure you read the contract and are willing and able to comply with all it says!